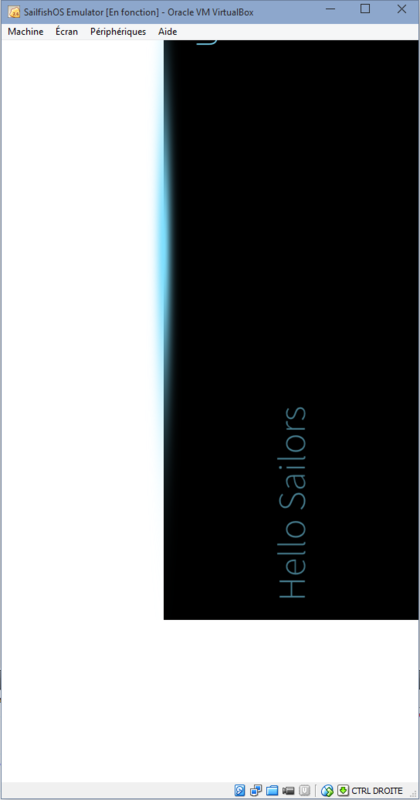 Since I like so much my Jolla phone and its UI paradigms, I thought "Let's develop some Sailfish app, that will be fun!". Right now, I'm stuck at "My First App" deployment (https://sailfishos.org/develop/sdk-overview/develop-firstapp-article/) of installation guide-through, with this funny outcome - see screenshot attached. Any hint of where to look, logs to browse, settings to play with, or anything that would explain that stuff and help solve it - meaning display it properly, the way it is intended, portrait mode, everything *whithin* screen borders ? My installation:* Very capable laptop running Windows 8.1 (a.k.a. host), with various softwares installed, amongst them VirtualBox 4.3.22* In that VirtualBox, one Windows 10 Technical Preview VM, running latest said version with all updates, 32 GB HDD, 3 GB RAM - a.k.a. "guest"* In "guest", everything needed for Sailfish development installed, configured & running, with latest versions (i.e. VirtualBox 4.3.2 w/ Extension Pack, SDK v1412, sailfish VMs ok, MerSDK + emulator). The reason Sailfish emulator display is not *quite* in the *right place* is probably because it is a Linux VirtualBox VM run in a Window 10 VirtualBox VM - Sailfish OS is probably a bit confused and got left/right and up/down mixed up. I'm sure there's a way to fix this, but I'm not quite sure of where to look in the first place. Also, I'm pretty confident it's got nothing to do with VirtualBox - both of them - settings, because I've already tried LOTS of different things. And also when starting emulator VM from VBox interface, it also behaves the same way, displayed like it is landscaped. So my guess is emulator is either interpreting or getting wrong parameters from "guest" VM, thus this display we might qualify as "a bit shy" - but still working, including pulley menu.